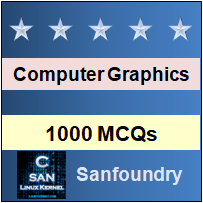 This set of Computer Graphics Multiple Choice Questions & Answers (MCQs) focuses on “Two Dimensional Viewing”. 1. A view is selected by specifying a sub-area of the __________ picture area. Explanation: We consider a formal mechanism of view, that is, which part of the picture is to be displayed. That’s why we select a view by specifying a sub-area of the total picture area. 2. Co-ordinates are ranging according to the screen resolution. Explanation: When we display a scene, only those objects which have a particular window are displayed. So for that mechanism to work, co-ordinates are made to range themselves according to the screen resolution. Explanation: World Coordinate Systems (WCS) are the type of coordinate systems which describe the physical coordinates associated with a data array, such as sky coordinates. It is also used to denote wavelengths of a spectrum and to draw astronomical images. 4. Which of the following co-ordinates are NOT used in 2d viewing transformation? Explanation: Vector co-ordinates are used to denote vectors which are physical quantities having magnitude as well as direction. In 2d viewing transformations- Modelling co-ordinates, viewing co-ordinates, Normalised co-ordinates and Device co-ordinates are used. Explanation: Clipping is the process of cutting out extra material. In the context of computer graphics, clipping is a method to selectively enable or disable rendering operations within a defined region of interest. 6. For a 2d transformation viewing, in how many ways a clipping algorithm can be applied? Explanation: Clipping algorithm can be applied in two ways for 2d transformation viewing. Two ways in which clipping algorithms can be applied are- 1) world co-ordinate clipping. 2) viewport clipping. 7. Which of the following is NOT a type of clipping algorithm used on the raster system? Explanation: Since clipping is done in 2 dimensional viewing and solid is a 3 dimensional object so clipping algorithm can’t be applied on a solid object. Instead of solid clipping, there is another type of clipping algorithm known as curve clipping. 8. For a point to be clipped, which of the following conditions must be satisfied by the point? Explanation: A point P(x,y) is NOT clipped if x is more than the minimum value of x and less than the maximum value of x. Mathematically, it can be written as “xwmin ≤ x ≤ xwmax“. 9. For a point to be clipped, which of the following conditions must be satisfied by the point? Explanation: A point P(x,y) is NOT clipped if y is more than the minimum value of y and less than the maximum value of y. Mathematically, it can be written as “ywmin ≤ y ≤ ywmax“. 10. Which type of clipping is used to clip character strings? Explanation: Text clipping is the algorithm which is used to clip character strings. It depends on the methods which are used to generate original characters. 11. In polygon clipping, line clipping algorithms can be used. Explanation: Polygon is a two dimensional shape formed by straight lines. So we can conclude, polygon’s basic components are lines, hence line clipping algorithm can be used for polygon clipping.